Hello lovelies! Bit of a different kind of review for you all today, I'm not sure I've ever reviewed a product like this before, but I was recently sent this Yon-Ka Age Defense Creme 93, Balancing Combination Skin - which is a posh name for an anti-ageing moisturiser for combination skin and thought I'd share my thoughts on it. I know what you're thinking, Chloe, you are 18 years old why on earth are you reviewing an anti-ageing cream? Don't get me wrong, if I'm sent a product that I don't like and will not use, I won't review it. I politely let the company know that the product wasn't for me and be done with it, however, despite this definitely not being targeted towards my age range, I am beauty blogger and a beauty therapist. Two things that have given me an overwhelming fear of ever ageing, ever. So if I can get an early start, I'm going to do so. Am I crazy? Maybe. But we'll see who gets the last laugh when I get asked for I.D when I'm 50! Unlikely? Oh. Anyway, moving on. I was a little concerned about trying this product, as when the weather is a bit warmer as it is right now, my skin does tend to be a little more combination i.e. slightly more oily in places and normal in others, rather than its generally normal type in the cooler months. So, even though this is for combination skin, I thought maybe it might be a little too rich as it is an anti ageing cream. How wrong was I? This is a lovely light moisturiser that sinks in super quickly and doesn't leave my skin feeling greasy at all. As for anti-ageing, being 19, I'm not really the best guinea pig for an anti-ageing cream. However, one thing I have noticed is that my makeup doesn't settle into my pores and under eye lines at all really since using this. This really is great for combination skin, as it's getting towards summer (or not), my skin can go a bit mad. In the warmer weather, I can get oily around my t-zone where the rest of my face will stay pretty normal. This moisturiser is great for that. Its super hydrating on the areas that need it, but it controls the shine on the oilier areas too which is fab. 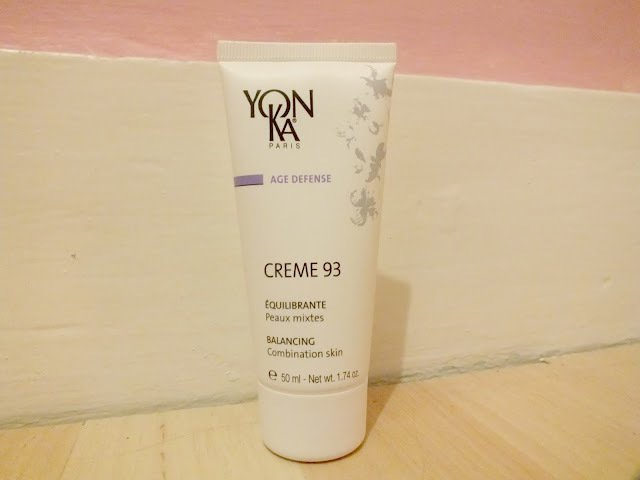 You can read more about this moisturiser on the Yon-Ka website here. What do you think? Would you like to try this moisturiser?